Posh manager Grant McCann (right) and his assistant Lee Glover watch their side slip to defeat against Oxford. Photo: Joe Dent/theposh.com. Peterborough United manager Grant McCann insists his side were unlucky losers in their League One fixture at home to Oxford United today (March 11). Craiag Mackail-Smith is congratulated by Brad Inman after scoring his 100th goal for the club against Oxford. Photo: Joe Dent/theposh.com. The visitors won 2-1 with Posh striker Craig Mackail-Smith claiming his 100th goal for the club in injury time. Posh are now down to 12th place in League One, still eight points adrift of the play-off places, but it’s now three defeats in a row for McCann’s men. McCann said: “That game wasn’t ‘easy’ for anyone so that comment (from Appleton) is ridiculous. Phil Edwards (16) heads Oxford in front from a corner at Posh. Photo: Joe Dent/theposh.com. “For a lot of that game we matched them and were better than them. That’s not me being biased, that’s the reaction of someone who’s played the game and been around the game for a long time. “People bang on about about us not creating chances, but we created 18 really good chances today. We just weren’t ruthless enough and their goalkeeper made some good saves. “Obviously we’re disappointed with the result. Individual errors cost us again and once more were weren’t ruthless enough in both penalty areas which has been the problem since January. “For 20-25 minutes the lads stuck to what we had worked on in training and we played well. We were on the front foot. We took the game to them and if Leo had scored with his early opportunity it might have been a different story. “But we then conceded because we lost concentration at a corner and that set us back. It shouldn’t have because the players are professionals and they should be able to respond to set-backs. “We were caught napping at a throw-in for the second goal, but the lads dug deep at 2-0 down and kept creating chances. We sinply have to learn to finish teams off when we are on top. “I’m sounding like a broken record, but I believe 100 per cent in these players. We had a good week in training, but the players have to perform when there is a bit of pressure on them during games. 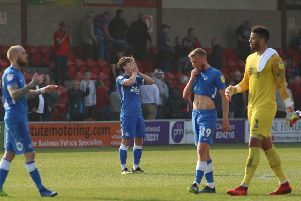 Attacking talisman Marcus Maddison missed the match because of a long-standing niggle. He has not been ruled out of Tuesday’s trip to Chesterfield. Midfielder Anthony Grant was left out for tactical reasons. McCann had no news on the injury that forced right-back Michael Smith off in the first-half. Harry Anderson made his first Posh appearance for 18 months as his replacement.